You are currently browsing the SafeSourcing Blog blog archives for February, 2010. Retail e-procurement. What about your existing relationships. I could not agree more with the above comment. So beyond just reducing their prices which should not happen if you are being treated fairly, how else do suppliers benefit from participation in e-procurement events such as reverse auctions so that it is win-win? Customers quite often ask us why suppliers would want to participate in an e-procurement event. A discussion usually follows relative to incumbent suppliers vs. new sources of supply. In general most vendors in the space would come up with many of the same points listed below. Please read on. SafeSourcing? places a great deal of value in our SafeSourceIt??? Global Retail Supplier Database? which contains over 350,000? retail suppliers located in Mexico, Canada the United States, China, Korea, The United Kingdom, Japan and other countries. We place a great deal of value on each individual supplier regardless of their size. We believe that well thought out next generation e-procurement tools can provide significant benefits to buyers and suppliers whether they are hosting or participating in e-procurement events.? 3. Clean data relative to the soliciting or host company and an accurate listing of their event guidelines, specifications, terms, conditions and other information necessary to build an accurate and successful pricing strategy. 4. High quality training in event participation and strategy development. 6. Closed loop reporting of results of the specific e-procurement event a supplier participates in as well as a detailed supplier feedback questionnaire.. I?m sure many of you can come up with other reasons. E-procurement events have to be win-win if they are going to become part of a retail companies on going business processes. Just what is a collaborative supply chain or for that matter collaboration in general as it applies to procurement. We often hear the term collaboration or collaborative partners, collaborative supply chains, collaborative commerce or? collaborative networks when we are discussing the supply chain. It rolls of everyone?s tongue like we all know what we are talking about. So this author took a look at Wikipedia hoping to gain some insight and clarity. Let?s take a look at a small regional retail chain as an example. They buy their products mostly from wholesalers who are able to aggregate the volumes of many in order to earn enough discounts to pass on reasonable pricing to the retailer that is slightly better than the retailer might earn on their own, and reserve a little for themselves in order to support their business. These products are normally for resale products. In the not for resale area or expenses category such as supplies and services, the regional retailer usually does business with a number of local suppliers. The supplies can include everything from cleaning fluids to paper bags. The supplier normally does good job of managing these products against a number different cost structures to maintain a customer margin that is good for them. As an example if the price of oil is up and the resin market high, the supplier might be making less on plastic products such as plastic shopping bags or t-sacks, soup containers, trash can liners etc. The supplier may however also carry paper products and other supplies that can be mixed together to drive a total customer margin. Retailers can do the same thing. Here?s a partial list of how collaborative aggregation can work. Here are some e-procurement produce and perishable replenishment thoughts and principles for retail buyers. Retail procurement professionals need to be aware of more than just pricing when buying produce and other perishable products with electronic tools. Sometimes we spend to much time watching indices and being concerned about price when there are other issues that can quite frankly be overlooked and impact the quality and safety of what our consumers expect in their produce and other perishable purchases. There are literally dozens of pesticides sprayed on produce and also many fertilizing techniques used that this blogger is sure none of your consumers are aware of. So who is the watchdog for the products that your buy. The answer is you. There are organizations out there that watch globally like the Environmental Working Group (EWG). But we already know you don?t have time for that. If you have never been to a farm that grows the products you are buying or visited a packaging facility you need to. So when you set up your e-procurement event for produce and other perishables here are some things to be thinking about daily in your specifications. Don?t make the mistake of just running your events daily without constantly reviewing and adjusting more than quantity and price. Here are some top of mind items you should be thinking about. Retail e-procurement savings. How many times have we heard we can do it better ourselves? And for those very large retail companies that have very expensive internal tools that were sold to you by the largest players in the space. Ask yourself why your event savings are much less than those reported by companies who have outsourced this functionality? If you want to drive the greatest possible savings across the broadest range of categories in the shortest amount of time; and have a sustainable process moving forward keep reading.. The question one needs to ask is; what type of event services does my e-procurement provider offer? If your company is deciding to try self service, which is to be 100% self-sufficient, you need to know if your provider offers readily available classroom education that can be conducted on-site in order to train your team in all the nuances of event support. These skills are the foundation that allows e-procurement providers to support large volumes of events in a full service mode, which drive greater savings over the long term. Knowledge transfer in this area is one thing; the passion, skill and headcount to carry out these practices on a day by day basis are what drive results. Event management provides end to end e-sourcing support that begins with a companies overall strategy and ends with the actual execution of the e-procurement event. This is a true cross category effort that includes a rather lengthy list of services that may include buyer training, supplier selection, category discovery, supplier communication, the strategy for taking a category to market, training and overall supplier expectation management. These services are normally provided by people behind the scenes with a very specific skill set. If you plan to do self service it would be very wise to make sure you have them covered at the same quality level. Retail Procurement professionals should visit the SafeSourcing Wiki? So, what is the SafeSourcing Wiki and why is it any different? SafeSourcing is a company dedicated to procurement, to retail and to e-negotiation while also supporting a supply chain that is safe and environmentally sound. It makes sense that the SafeSourcing Wiki would be referred to as a specialized wiki (in this case retail e-procurement) that concentrates at a minimum on any or all of the following. 1.?Retail procurement terms and links. The nice thing about wikis is that the definitions are not static. Authorized users or members can add to definitions or create new definitions and terms as well as rate site content. In this way a body of work can grow from the collaborative contribution of all users and visitors and assist in to providing a reliable source of data for professionals in a specialized field. Please visit the Safesourcing wiki regularly and add your comments, terms, definitions and suggestions. This section of the SafeSourcing website is free tool, and it is for your use as a retail procurement and supply chain professional, the most difficult job in retail. We? look forward to and appreciate your comments. Retail buyers you should know your SPI codes. Part II of II. 5. Polypropylene (PP). Polypropylene has good chemical resistance, is strong, and has a high melting point making it good for hot-fill liquids. PP is found in flexible and rigid packaging to fibers and large molded parts for automotive and consumer products. 6.?Polystyrene (PS). Polystyrene is a versatile plastic that can be rigid or foamed. General purpose polystyrene is clear, hard and brittle. It has a relatively low melting point. Typical applications include protective packaging, containers, lids, cups, bottles and trays. 7.?Other. Use of this code indicates that the package in question is made with a resin other than the six listed above, or is made of more than one resin listed above, and used in a multi-layer combination. Understanding your companies CSR initiatives around recycling and what the container codes mean and don?t mean on the containers your are buying is an important part of your sourcing initiatives. Retail buyers you should know your SPI codes. Part I of II. SPI (The Society of the Plastics Industry) codes were developed to meet all recyclers? needs and also provide manufacturers a consistent, uniform system that could be applied across the country. Most if not all municipal recycling programs target all types of packaging containers. The SPI code offers a way to identify the specific resin content of bottles and containers commonly found in the residential waste. Let?s take a look at the first four. 1. 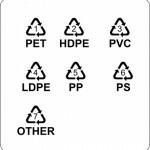 ?Polyethylene Terephthalate (PET, PETE). PET is clear, tough, and has good gas and moisture barrier properties. Commonly used in soft drink bottles and many injection molded consumer product containers. Other applications include strapping and both food and non-food containers. Cleaned, recycled PET flakes and pellets are in great demand for spinning fiber for carpet yarns, producing fiberfill and geo-textiles. Nickname: Polyester. 2.? ?High Density Polyethylene (HDPE). HDPE is used to make bottles for milk, juice, water and laundry products. Unpigmented bottles are translucent, have good barrier properties and stiffness, and are well suited to packaging products with a short shelf life such as milk. Because HDPE has good chemical resistance, it is used for packaging many household and industrial chemicals such as detergents and bleach. Pigmented HDPE bottles have better stress crack resistance than unpigmented HDPE bottles. 3.?Vinyl (Polyvinyl Chloride or PVC). In addition to its stable physical properties, PVC has excellent chemical resistance, good weatherability, flow characteristics and stable electrical properties. The diverse slate of vinyl products can be broadly divided into rigid and flexible materials. Bottles and packaging sheet are major rigid markets, but it is also widely used in the construction market for such applications as pipes and fittings, siding, carpet backing and windows. Flexible vinyl is used in wire and cable insulation, film and sheet, floor coverings synthetic leather products, coatings, blood bags, medical tubing and many other applications. 4.?Low Density Polyethylene (LDPE). Used predominately in film applications due to its toughness, flexibility and relative transparency, making it popular for use in applications where heat sealing is necessary. LDPE is also used to manufacture some flexible lids and bottles and it is used in wire and cable applications. During tomorrows post we will discuss the final three codes and some thoughts as to what they mean in your work. Have you checked your refrigerator lately? It only took me a minute to find a problem. This is not a new subject for this blogger, and just to make myself clear again, all retail buyers and category managers responsible for putting container foods on the shelves of our supermarkets, convenience stores, drug stores and other specialty stores should not be buying products that contain the chemical BPA. This author has a question for all the buyers mentioned above. If it were possible to have the chemical BPA in a glass would you drink it or have your children or grandchildren drink it? Let?s be honest, the answer is a big fat NO! An article in USA TODAY by Wendy Koch titled Bans sought for chemical found in baby bottles focuses on the fact that many states are seeking bans of the product. Our federal government has had the opportunity to declare BPA unsafe for years and follow in the footsteps of other countries like Canada and Japan that have already done so and found alternative ingredients. It really comes as no surprise that states are leading the way based on the bureaucratic mess we have seen come to a head in our nations capital recently? which have spawned activities like the tea party and politician resignations. It?s actually prophetic that the states are doing something that the feds can not do because our founding fathers always thought that the power for change should reside in the sates anyway. As further evidence that the states need to drive this effort our federal organization the Food and Drug Administration or FDA recently said it has ?some concerns? WOW. The product in my refrigerator is a major national brand that was purchased at a national supermarket chain that should know better. Here is a simple message to the buyers and category managers addressed above. Ask if food product containers you are buying contain the chemical BPA. If they do, don?t buy them. I know you would not ask your family or loved ones to consume them. Why use E-Negotiation, e-Procurement or Strategic Sourcing tools? This author has discussed on many occasions the various benefits to retailers of using e-negotiation tools. Not the least of which is significant profit improvement. Simply put if a retailer were seriously to assign twenty percent of their above the gross margin line spend to these types of tools, they could increase their net earnings by up to 100%. In addition, much of the following would also happen. If you are wondering why most companies are not enjoying these benefits, the following are the objections we to often hear during initial discovery meetings with managers that have not been exposed to e-negotiation tools in the past. One thing you may notice is that the companies almost always include me or I and almost never we. To much individual emphasis is not a good thing. Healthy skepticism is. If you have an objection that is not listed above, or they pretty much fit your thinking, please review the dozen benefits above and weigh your objections against them. This author has posted about this subject before during discussions about food contamination, e.coli, salmonella and other related subjects. What bothered me was the response I got from the hotel which has become too typical for organizations when a consumer complains was. ?Not us not here?. I called the front desk to ask if my stay could be extended as I was in no shape to travel let alone be talking on the phone. I was immediately transferred to the head of the food and beverage department. After a brief but polite description of my condition I was lectured that it could not have happened here. I was the led down the path of we check our batch numbers regularly etc. and after all food poisoning can not take place in as little as four hours. We discussed who I was and SafeSourcing to which I was told he had read my blog before. I said since that is the case please read my Monday post and I will bring you up to speed as to what you need to know about food poisoning and its potential severity and that it did not mean he had bought tainted products or even had poor food preparation practices. So here you go and if you have any further questions please give me a call. By the way thanks for comping the extra night. According to emedicinehealth.com Food poisoning is a common, usually mild, but sometimes deadly illness. Symptoms of food poisoning depend on the type of contaminant and the amount eaten. The symptoms can develop rapidly, within 30 minutes, or slowly, worsening over days to weeks. Most of the common contaminants cause nausea, vomiting, diarrhea, and abdominal cramping. Usually food poisoning is not serious, and the illness runs its course in 24-48 hours. Viruses account for most food poisoning cases where a specific contaminant is found but ?there are many many causes that all food workers should be aware of and it is much ?more than just e.coli and salmonella which get most of the press. So according to ?emedicinehealth.com there are many other causes and here are 20 of them.